Mitsubishi announced the retail price of its i-Miev electric car this week, setting the bar at an astonishing £38,699 including VAT. This is substantially more than most were expecting – ourselves included – and means that even after the government subsidy of £5,000 from January next year, the compact, four-seat electric kei-car will still cost almost £34,000 before options. Some will clearly view this price point as evidence that electric cars are not economically viable at present, but we suspect some other factors need to be considered first. For example, who is Mitsubishi hoping will buy this particular car at this particular price? Certainly not consumers – no private buyer in their right mind would spend this much on this kind of car. The i-Miev is nice enough to drive, but it’s no heart-over-head Tesla Roadster. Which leaves business buyers, and here a curious set of facts emerge. First, there’s the bane of user-choosers’ lives: benefit in kind (BIK) tax. This is the process by which the government puts a price on the perk of being handed a company car and taxes you accordingly. Sit behind the wheel of a company 3-Series or A4 and you can end up paying a couple of hundred quid a month to the taxman for the privilege. But sit behind the wheel of an electric car and, from April this year, you pay nothing. For the next five years, electric cars are zero-rated for BIK purposes. Next, there’s a thing called capital allowances. This is a process by which the government encourages business investment in particular things by providing tax breaks – and in the case of low-emission cars again the situation is quite advantageous. If a company buys an electric car it can set 100 per cent of the outlay against tax in year one – pretty much right away, in other words. 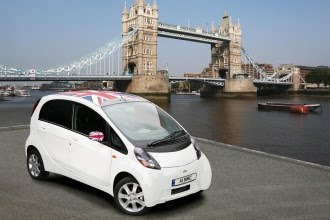 Assuming your company would normally need to pay at least £34,000 in tax on its profits it can buy an i-Miev, claim the full cost back from the Treasury, and let you drive it without bumping up your income tax. The short version: for many UK corporate buyers the actual cost of the i-Miev really doesn’t matter (within reason) as they won’t be footing the bill. All they’ll be paying for is servicing, insurance and the paltry cost of plugging it in overnight. HM Treasury will pick up the rest of the tab, ultimately with taxpayer cash. Small wonder that Mitsubishi has sucked its corporate teeth, wondered exactly how much it can get away with, and pitched the price as high as it has.